Although I’ve lived most of my life in boring, flat, southern Ontario, I grew up in the geographic drama of the Canadian west coast. After school, we played in the woods and on the beaches surrounding our South Delta suburb. In the summer, our parents took us to Long Beach on Vancouver Island, before Pacific Rim was a national park and Tofino a popular tourist destination. I also went to a summer camp in the Gulf Islands, where we spent most of the day either in, on or around salt water. That’s why I like wild places so much. I haven’t been to Long Beach in almost 20 years (sniff). But I’m lucky enough to spend a month or more every summer now in the wild confines of Georgian Bay. Initially that meant Killbear Provincial Park, also with long, sandy beaches. 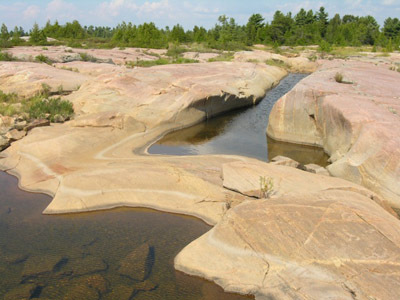 Now it’s a cottage north of Pointe au Baril, where the best vista is “Painted Rocks”, a kilometers-long expanse of flat pink granite, exposed on its end-grain by geomorphic action and polished smooth by pounding waves. There’s no sand, but the Bay is almost as fearsome as the Pacific on a stormy day. Despite the spartan landscape, it’s a completely comforting place, for me at least. I live in Guelph really, but my heart lives in Georgian Bay. Hear hear. I LOVE everything Georgian Bay, especially up that way. It’s such a privilege to live near this amazing body of water.